Today I am so pleased to welcome Bellora Quinn and Sadie Rose Bermingham to Joyfully Jay. 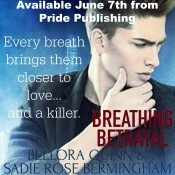 Bellora and Sadie have brought some questions and answers about their latest release, Breathing Betrayal. They have also brought along a copy to give away. Please join me in giving them a big welcome! What was it that led you to write in the genre(s) you write? Sadie: I think it was primarily that I grew up reading ghost stories and paranormal/fantasy novels. I’ve always had a love of that genre, plots that took me away from the mundane world for a while. As to writing for the M/M genre, I’ve always been fairly genderfluid. I associate more with my masculine than my feminine side and came to realise in my teens that I felt more like a gay man in a female body than an ordinary woman. When I was about 14 or 15 I discovered the works of Christopher Isherwood (who created the novels on which Cabaret was based) and realised that he was writing about a world that felt normal to me. It just felt natural for me to write about men who loved other men. Are your books character led or plot led, or both? Sadie: Definitely character led. I usually get a character or a scene in my head first of all, then begin to develop that scene and build on who the character in my head is until he takes me where the story needs to go. When we started out writing Breathing Betrayal, we did outline a basic plot for the story first of all, but when we began to flesh that out it started with the two main characters. We wanted to know who they were, where they had come from, what they looked like, what motivated them. That went down in detail before we even wrote a word of the story. Sadie: I love world building. I have vast folders full of ideas for different world settings and character traits. I like my characters to be fully rounded people by the time they hit the page. That makes the writing process so much easier because I know how they will react in any situation. Also, because my memory is suspect, I like to have important details jotted down so that I can go back and check them if I’m not sure that something is right. Sadie: This isn’t going to be anything unusual, but I hate editing. It drives me to distraction going over the same thing again and again. I’m not good at endings either. I hate it when a story I’ve loved comes to an end. I have to work hard not to channel that need for the story to continue when I’m trying to tie things up. Sadie: Bellora and I are currently working on the editing book 2 of the Elemental Evidence series. We also have an idea in the mix for a fantasy novel featuring a pair of rogue sorcerers, one who is a disinherited prince, the other a social pariah, who join forces to seek out magical artifacts. I have a solo project on the go as well, about a young man who is a magnet for tornadoes and a journalist who is a storm chaser. 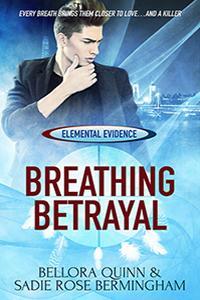 Sadie has brought a copy of Breathing Betrayal to give away to one lucky reader. Just follow the Rafflecopter below to enter. Lovely to have you guys! Thank you. And good luck if you’ve entered the giveaway. Thanks for sharing your thoughts and for the giveaway, Sadie and Bellora. Best wishes with your writing!